Bergbahnen Kleinarl “Bergbahnen Kleinarl” is the collective name for all the ski lifts that can be found on the Mooskopf (1,980 m) connecting Kleinarl with Flachauwinkl. This modern set of lifts offer a large capacity. Below, you can find more information on the “bergbahnen” of the Mooskopf (also called the Shuttleberg). The Champion Shuttle is the lift leaving from the valley of Kleinarl to the middle station. It is situated within walking distance (150 meters) of our accommodation and is accessible from our nursery slope. The bottom station is provided with a big parking and a bus stop for the Wagrain – Jägersee ski-bus. Heading down towards the valley a red slope is available. Since a blue slope has been added In the year 2016 – 2017, skiers of all levels now can make the descent. There is even a slope going all the way down into the center of town. The Bubble Shuttle runs from the middle station all the way up to the top of the Shuttleberg. It is situated next to restaurant “Galler”, where you can relax and enjoy the sun from a nice terrace. You will not get bored since a number of dazzling slopes runs down to the valley station (including red and blue slopes) offering you a variety of choices. During rush hour it might be a little busy, but the wait will never be longer than 10 minutes. If you want to avoid the lines, take a downhill in the morning and enjoy the slopes in top condition! The Fürstwandlift is a real gem. It’s an old tow lift running between beautiful pine forests and high cliffs. Here you experience the real traditional Austrian nature and wildlife. Deer could cross your path at any moment. One of the slopes runs along the lift, and it is normally a little quieter than the other slopes. 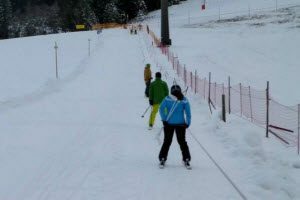 You can also check the off-piste skiing. Not a fan of tow lifts? Skiing down the Easy Slope, you can make your way to the Bubble Shuttle which will take you up again. 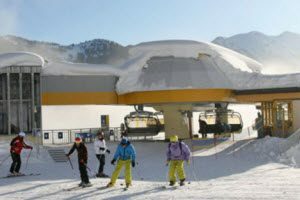 The beginners lift is located on the nursery slope in the valley of Kleinarl. 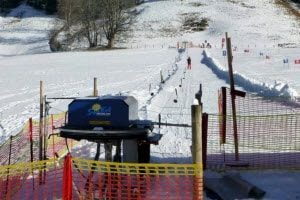 It’s a small t-bar (or button) lift offering children the possibility for their first attempts to go skiing or snowboarding. The nursery slope is an easy descent where parents can stay with their children while they practice. From the nursery slope there is direct access to the Champions Shuttle. Since our accommodation is located right opposite, you only have to cross the road to get there. Directly on the other side of the Mooskopf mountain is the Powder Shuttle. You will find the entrance of the Burton Park which offers controlled off-piste skiing. It also has various jumps and grinds where the free-riders can let off steam. From the mountain station two beautiful blue slopes lead into the valley and further on into the skiing area. On these slopes you will also find a speed-skiing track. Speedfreaks can have their speed measured and speeds over 100 km/h have been registered! The Absolut Shuttle leaves from the Chill House in the Absolut Park. It drops you at the start of the Funpark. The Absolut Park is famous worldwide and is one of the largest fun parks in the Alps. Tall jumps , grinds, half pipes and a huge wall provide the ultimate thrill. In addition, there is a downhill slope towards Flachauwinkl. From here you have beautiful views of the Enns Valley. The Family Shuttle is the lift that starts from the middle station of Flachauwinkl. The slope going down from this lift is the “Family Abfahrt” which is a nice track to cruise comfortably. But you will also find more challenging slopes. The track also has a real skiing road which brings you to the valley. The slope descends through a magnificent landscape of rock and woods. The Family Shuttle is one of the quietest lifts in the ski area. The Sunshine Shuttle starts from the valley of Flachauwinkl and goes up to the middle station. It lies at the exit “Flachauwinkl Salzburg – Villach” of the A10 motorway and is very accessible for commuters and day trippers. The downside however is that especially the weekends can be quite busy. From the valley station a bus takes you every 10 minutes to the Highliner which then brings you to the ski resort of Zauchensee. 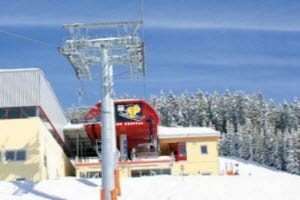 The beginners lift is located on the nursery slope in the valley of Flachauwinkl. It’s a small t-bar (or button) lift offering children the possibility for their first attempts to go skiing or snowboarding. 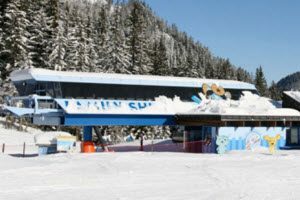 The slope offers gates that children can ski through to practice their skills in a playful way. 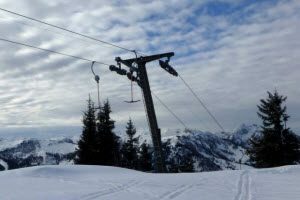 On the other side of the valley of Flachauwinkl there are lifts that go to the famous ski resort Zauchensee. 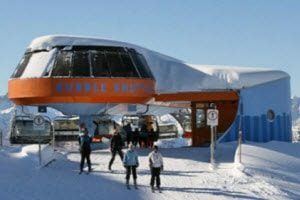 By bus you can reach the Skicentre Flachauwinkl and you can use the Highliner I + II (an 8-person gondola and 6-seater chairlift) to go up. The slopes on this side of the valley are more challenging than those on the Shuttleberg. These lifts are located at the exit Flachauwinkl of the A10. A toilet is located In every lift station. You can find ticket offices and information points at the valley stations. 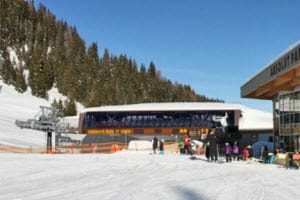 Lift passes can be delivered to us If you are staying at Camping Stockham so that you do nto have to queue up in line for the ticket office, and can go to the slopes directly. 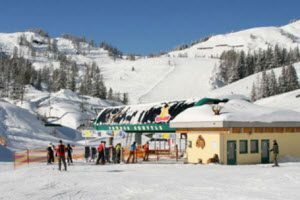 If you want to discover the ski resort of Kleinarl, enjoy the beautiful slopes and use the modern facilities and fast lifts, please book your accommodation directly with us, a guarantee for a carefree holiday.